Learn how to make full use of your iPad in this six-week course. We will cover different topics each week with plenty of time for questions and practice. Topics include: Settings and apple ID; What is iCloud? 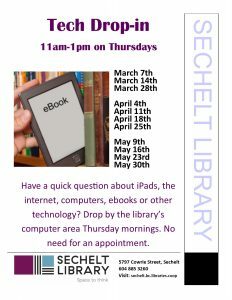 ; Surfing the web; Using default apps; Great library apps; and Troubleshooting and tips. This is a FREE program. Registration required. Drop by or call the Library (604-885-3260) to reserve your spot. 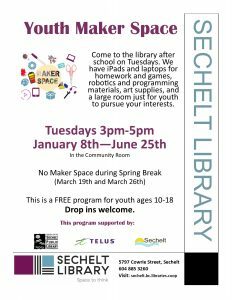 Youth Maker Space – for Youth ages 10-18. Come to the library after school on Tuesdays. We have iPads and laptops for homework and games, robotics and programming materials, art supplies, and a large room just for youth to pursue your interests. Tuesdays Jan 8th-June 25th (excluding Spring break: March 19th & 26th) See full list of dates below. A friendly once-a-month gathering to discuss your favourite books – fiction…non-fiction…biographies…it’s about ideas! Meets on the 2nd Thursday of every month from 1:30-3:30pm in the Community Meeting Room across the foyer from the library.